Formerly known as Dactylorhiza majalis subsp. occidentalis, the Hebridean Marsh-orchid is endemic to Scotland and occurs only in the Outer Hebrides on the northern coast of North Uist. This is a short plant, growing to a maximum of 18cm in height but usually much shorter than that. Leaves of the Hebridean Marsh-orchid are very distinctive: sharply pointed and with dark purple markings separated at the base, but which merge towards the points of the leaves so that they are often uniformly dark brownish-purple. The flowers are deep magenta - reminiscent of the colour of the Northern Marsh-orchid (Dactylorhiza purpurella). Lateral sepals of the flower protrude outwards and upwards almost forming a vee-shape, and the upper sepal and petals form a hood over the column of the flower. The lip (lower petal) is deeply lobed and has dark markings in the form of loops, dashes or spots which are sometimes almost indiscernible against the rich dark purple background colour of the petal itself. The best place to look for this orchid is in the species-rich coastal grasslands called the Machair, a calcium-rich habitat that is home to large numbers of chalk-loving wild orchids. 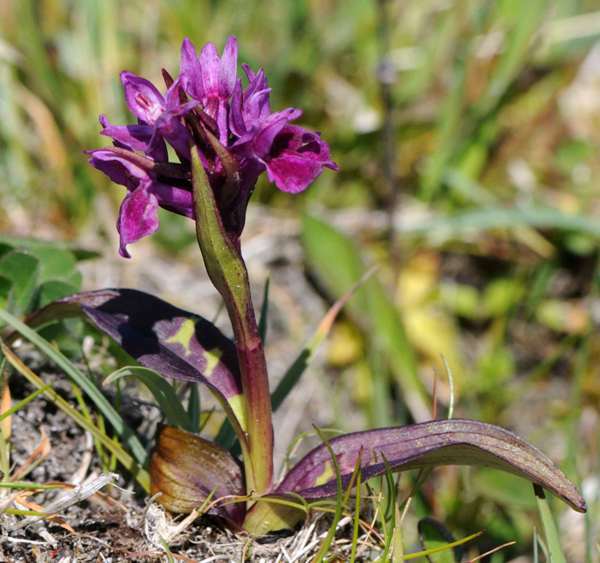 The Hebridean Marsh-orchid often occurs in small groups in the damper parts of the Machair which have been under water during the winter and early spring months and which retain a high level of moisture throughout the summer. 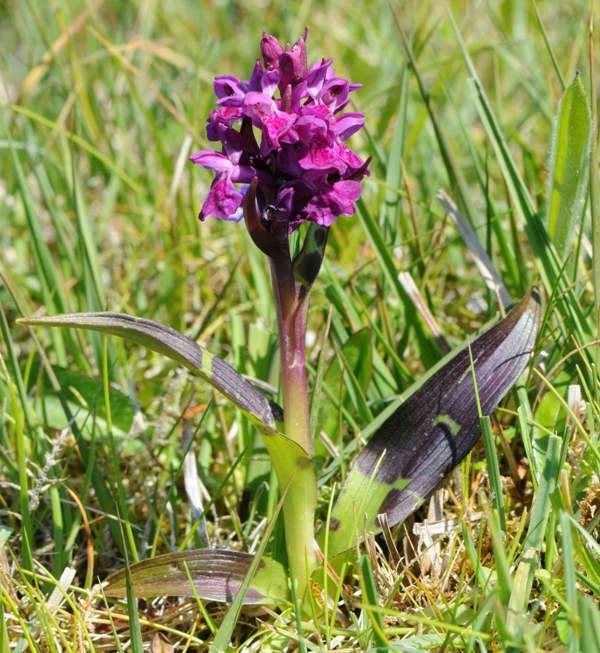 The Machair is a good place to see other wild orchid species including Early Marsh-orchid (Dactylorhiza incarnata), particularly its subspecies coccinea and the Northern Marsh-orchid (Dactylorhiza purpurella). Hebridean Marsh-orchids flower from mid-May to mid-June. Pictures by kind permission of Andrew Cleave Nature Photographers Ltd.